It’s been the most intoxicatingly perfect temperature outside. We hope you’ve been spending time porch-ing and hiking. 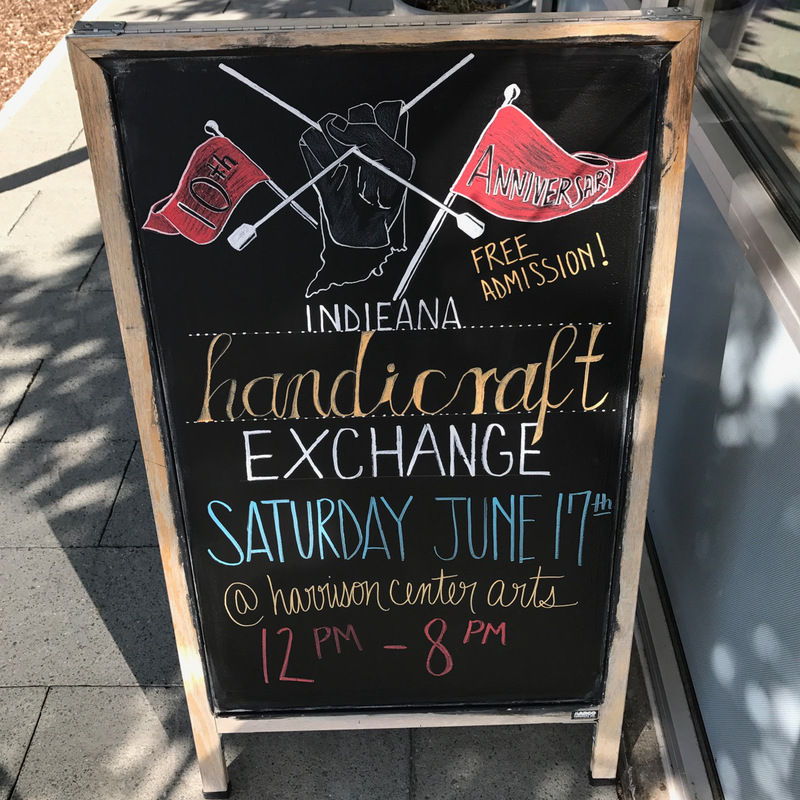 Enhance your outdoor adventures with handmade swings, pickles, hats, or party supplies from Homespun! Here’s a little taste of what’s new this week. 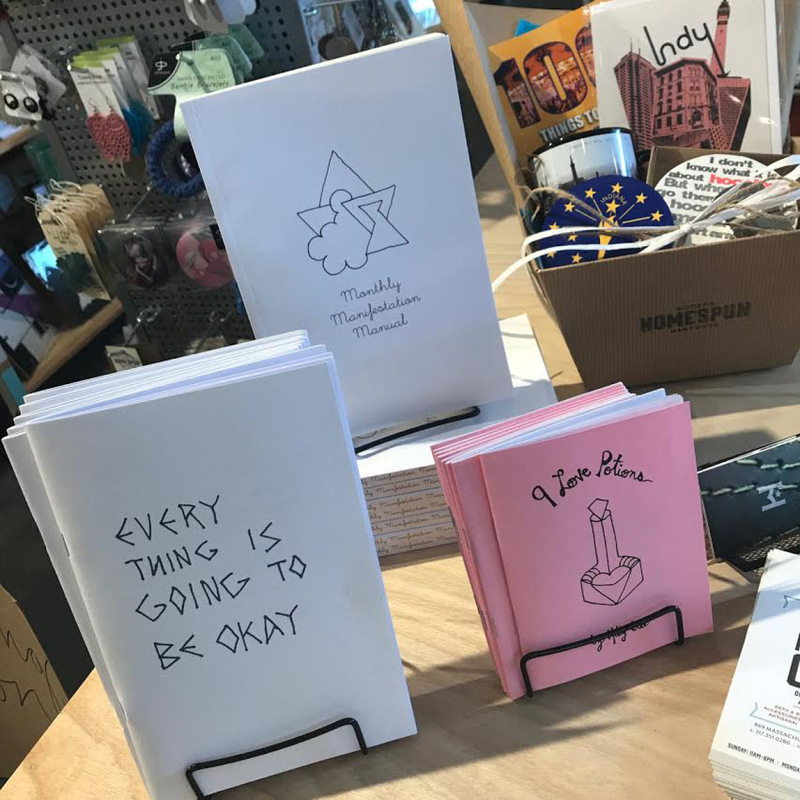 Love these uplifting new books from School of Life Design. Top three pieces are from new vendor Weeds and Wonder, the bottom two are from Field & Forest. 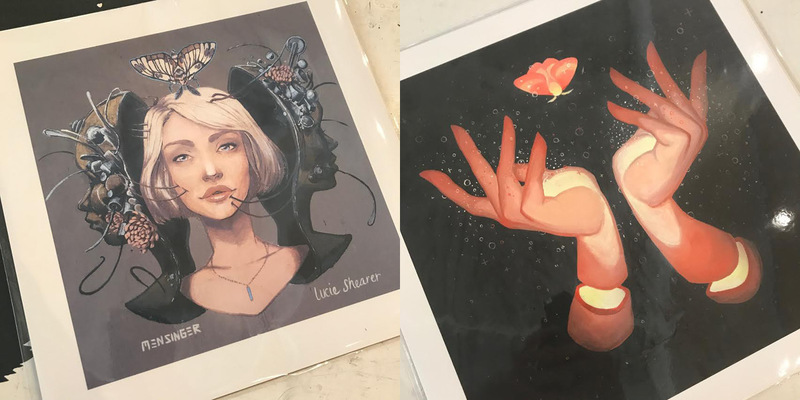 Beautiful paintings (in print form) by Lucie Shearer. 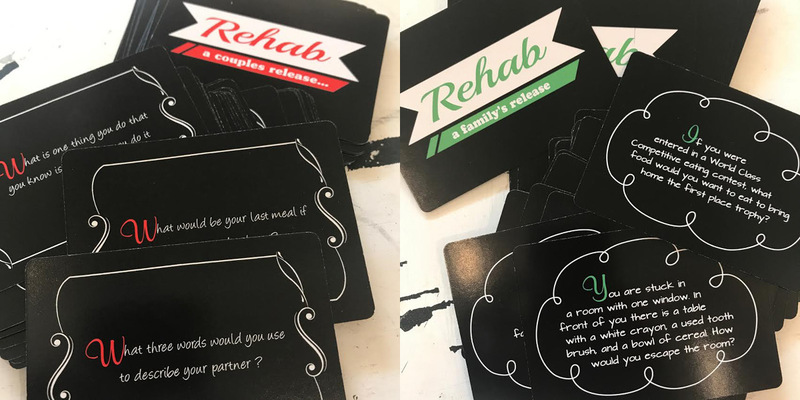 Really fun questions for families and couples! Spice up your life! 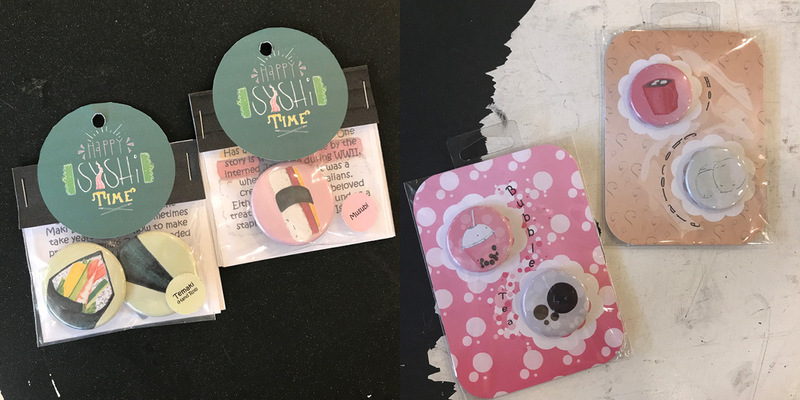 Sweet shiny patches from Boonie Patch Co. and a lovely new assortment of stickers by Jean Elise Toys. 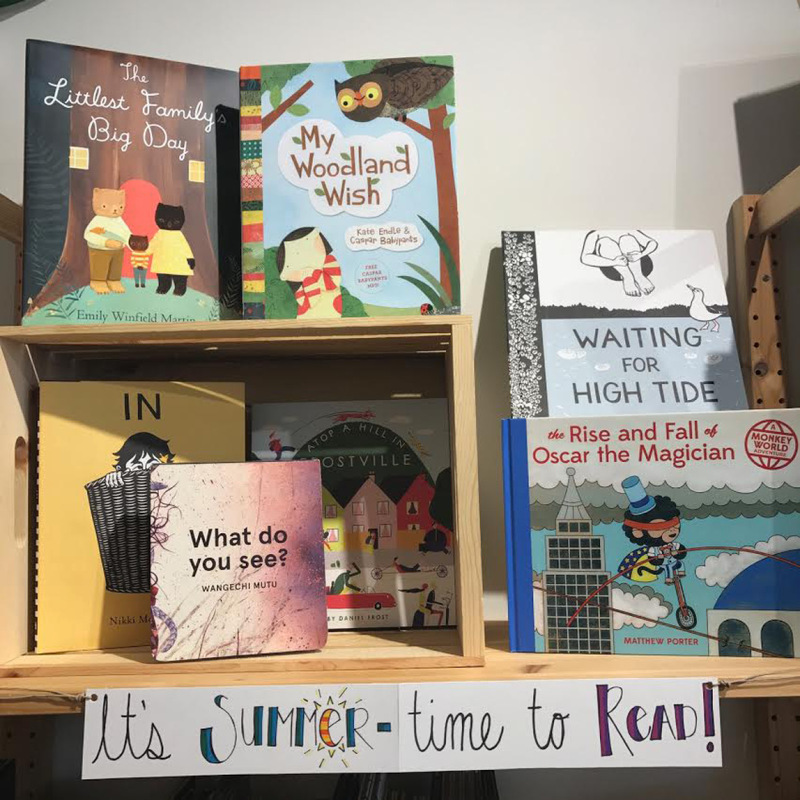 Our shelf displays are ready for summer fun! 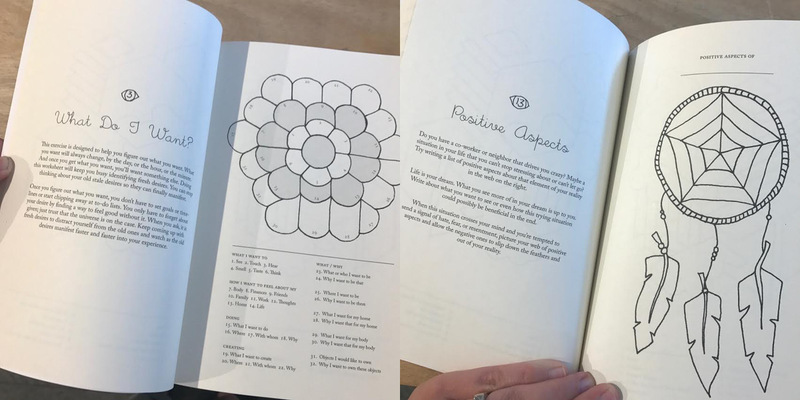 First Friday featuring Read Write Books: Friday, July 7th, 6-8pm: We invite you to join us for a new First Friday gallery opening in store featuring the hand-bound work of local artist, Lee Bennett, otherwise known as Read Write Books. 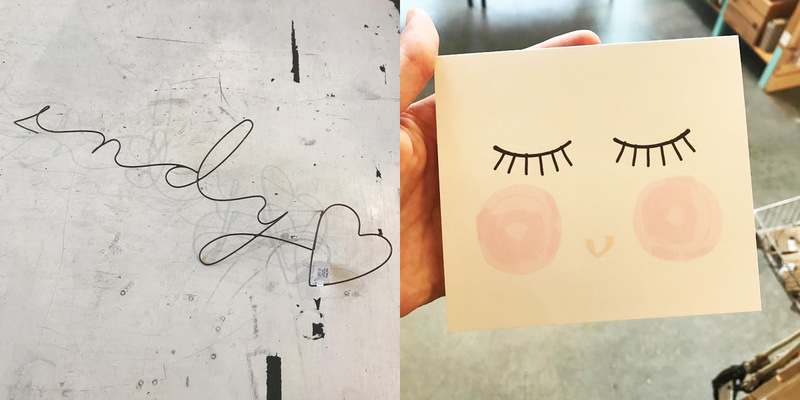 Bennett has been journaling since kindergarten and speaks of her work as “meaningful vessel(s) for you to fill with all your thoughts, drawings, bits and pieces that represent your current self.” In an electronics-ridden world, Bennett’s work literally reopens an era when pen took to parchment and cursive wasn’t dead. Each book is thoughtfully made and meant to last a lifetime. Bennett will be displaying her new series “Leatherforms” in our store during the months of July and August. 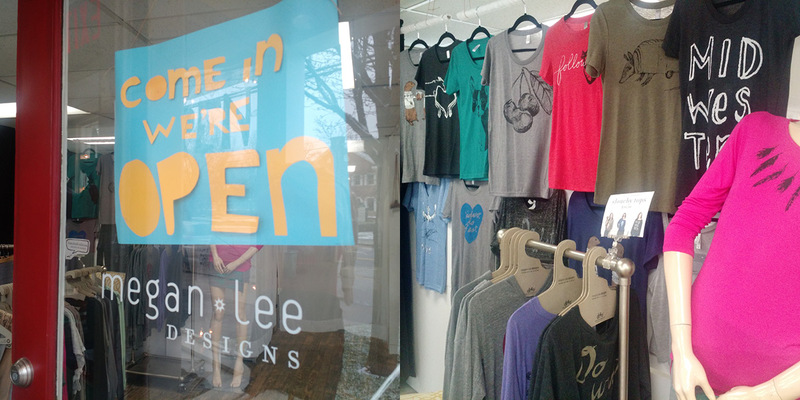 Megan Owdom-Weitz is the Megan behind Megan Lee Designs. 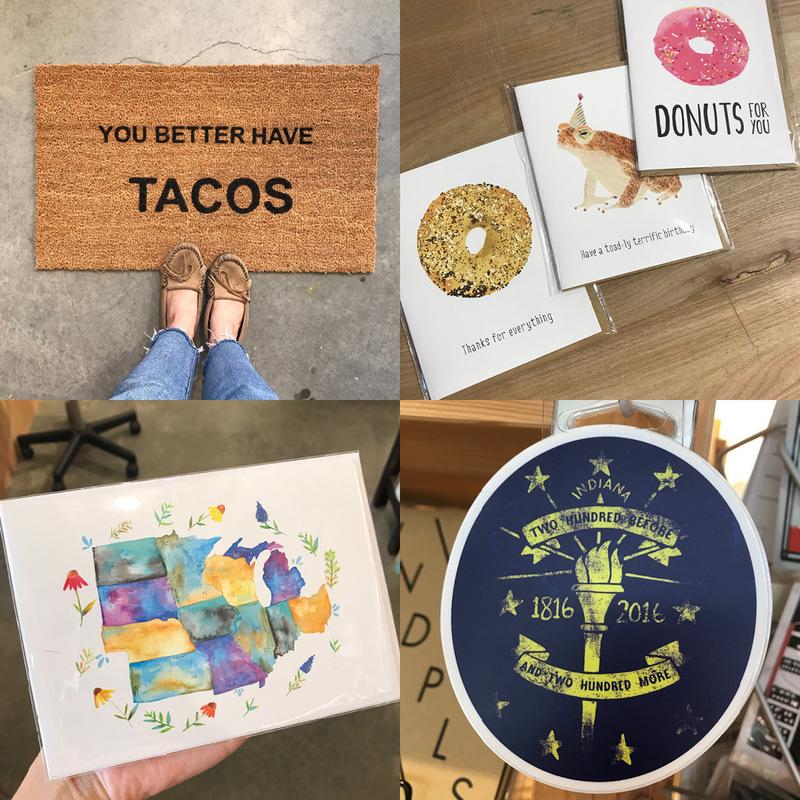 She creates quirky, state themed, hand-printed goods that are classics here at the shop. 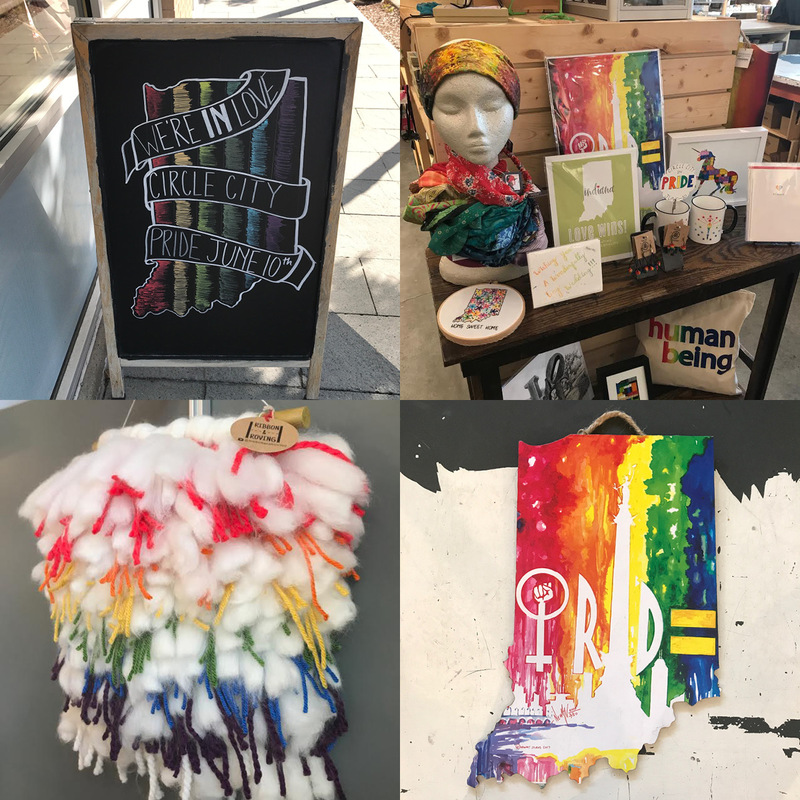 Read on to learn about her passion and her process, and stop by to check out some of her lovely (and funny) creations in person! This is actually really hard for us — we are constantly trying to figure out a way for people to understand what we do. 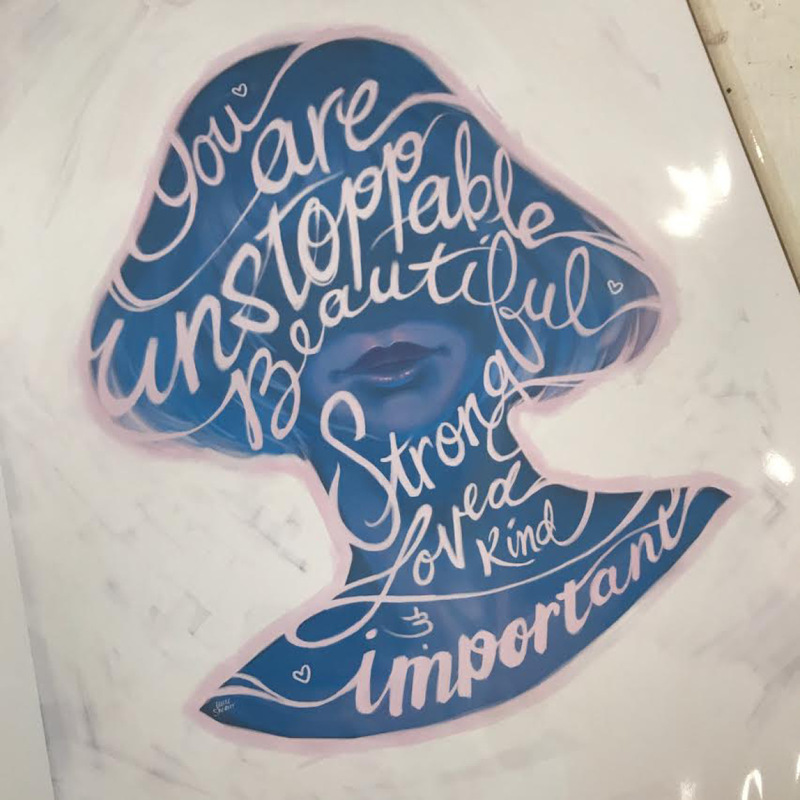 We often say that we are a screenprinting company, but really we are a design company that chooses to print our designs using silkscreens. I like to also think we could use the terms fashion and illustration to describe our business. I have always been a maker since I was young, I’m one of those weird people that likes to put together IKEA furniture. In college I got a design degree at Kent State and learned so much about the importance of negative space and many more design concepts like training your eye. It took me awhile to realize that I was happier making and designing by hand than just moving objects and type around on a computer. 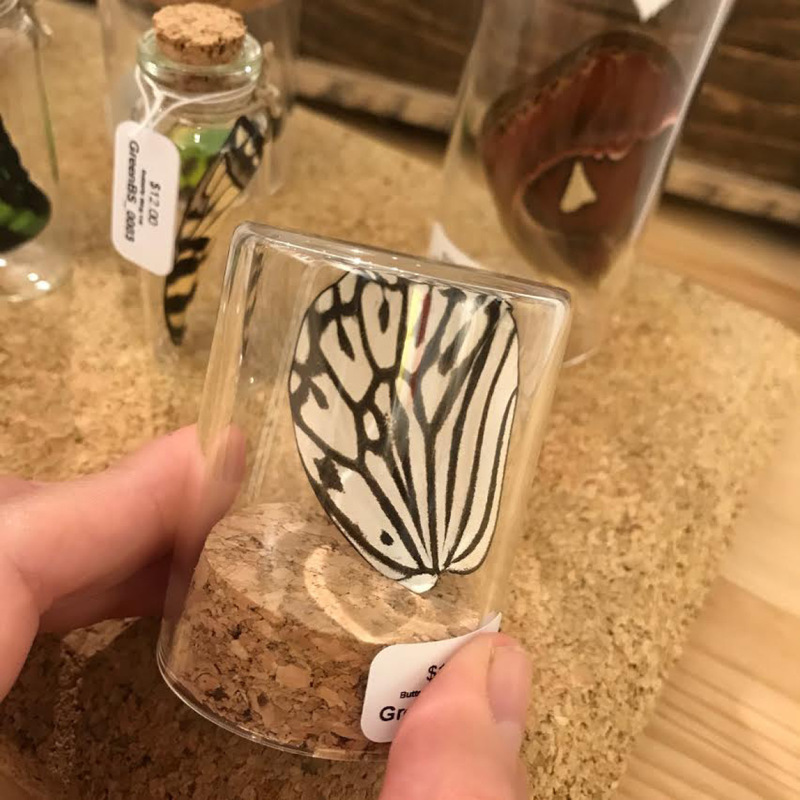 I love the flexibility most of all, but seeing smiles on peoples faces when they are shopping in person and finding shoppers that “get” my designs is the best feeling. 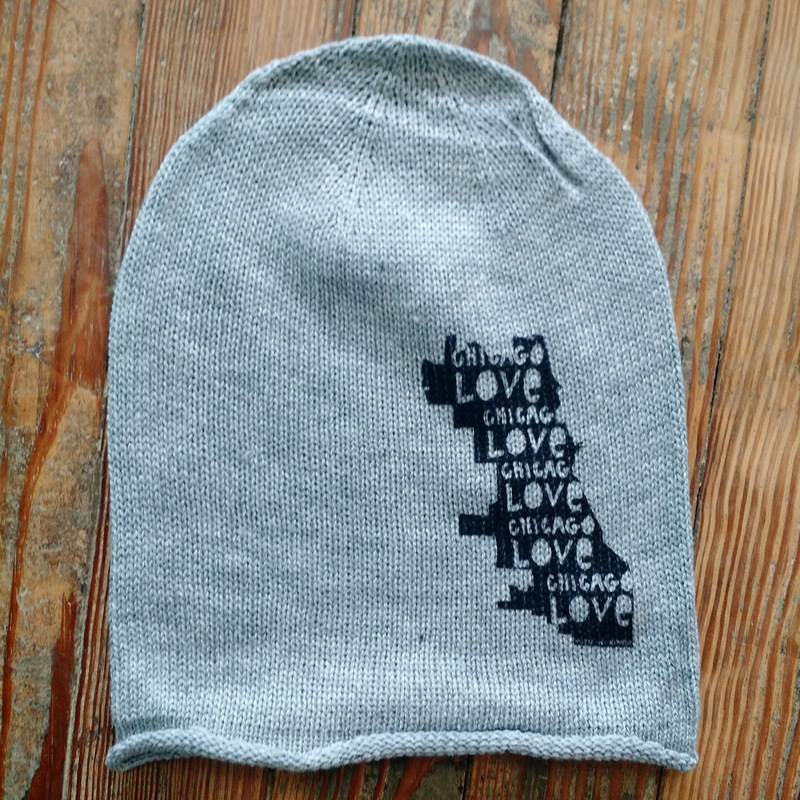 In college I had decided that I was going to work at a design firm and work on things like Annual Reports — which I did for awhile, and then I discovered the DIY movement in Chicago and began selling things that I had just been making on the side as a hobby. 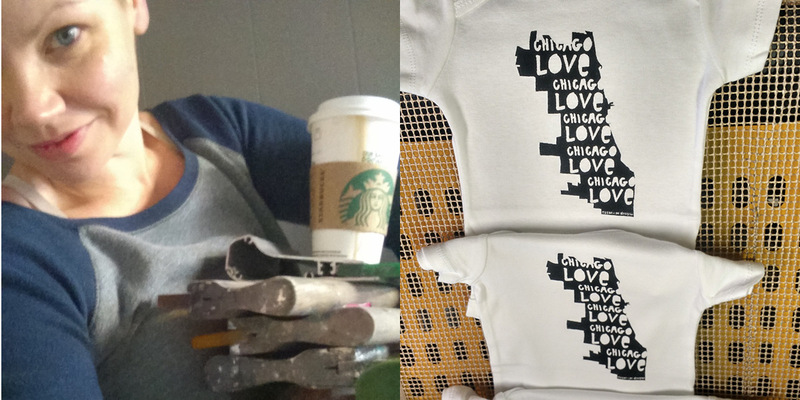 This was all before I learned to screenprint, but it planted the seed that I could possibly work for myself and started to change my ideas about what success could mean to me. This is always changing — we have a studio in Berwyn, but we actually just moved to Ohio (Westerville just north of Columbus) a few months ago and will eventually move our studio here. I used to do all of the printing and now I do almost none of it. I would like to do a bit more, but right now I am focusing on design and lots of day to day business tasks, along with taking care of a new baby and a toddler. 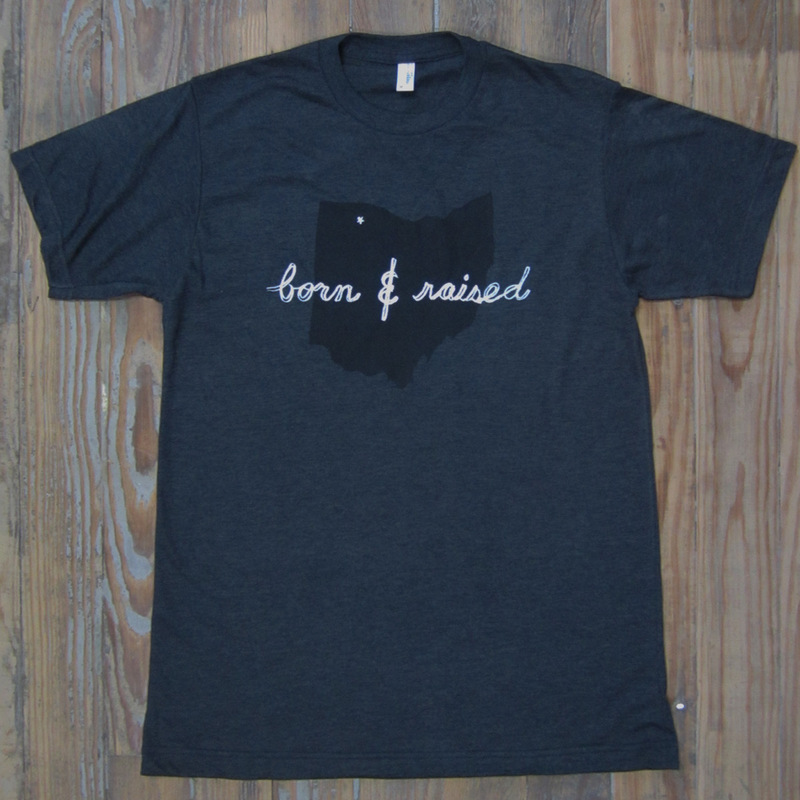 6| You are the maker behind our popular “I’m IN Love” tees- do you make a design for all 50 states? I DO have designs for all 50 states, and a few of the states have more than one option. 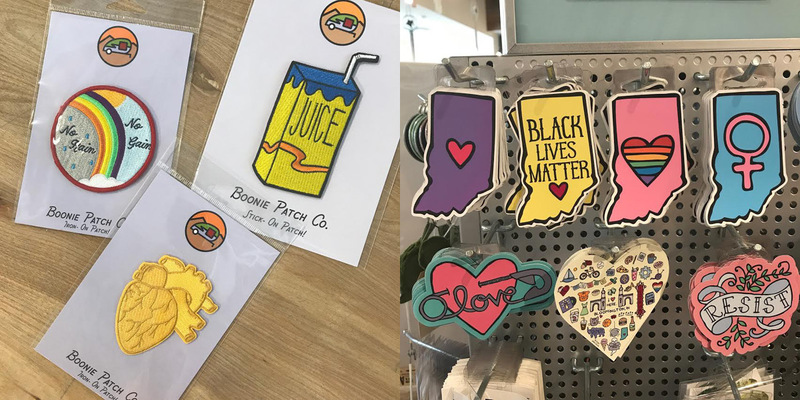 I started with the Midwest and then branched out when Nordstrom picked up our line and wanted to sell all 50 states online. 7| Tell us about your design aesthetic. What words would you use to describe your drawings? I would say fun, quick, sketchy, whimsical…I try not to try too hard because I feel like that’s when they don’t work for me. Often its my first go at a new subject that looks the best. I think it would be fun to be a “REAL” fashion designer for a bit — maybe Betsey Johnson? She always seems like she is having so much fun and I love her style. 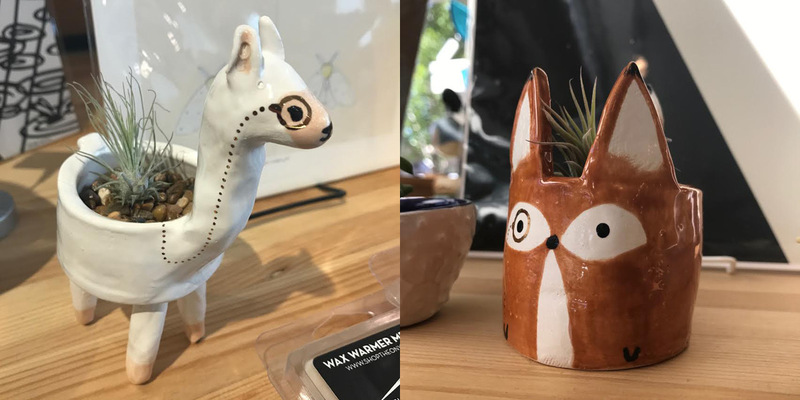 I think just the intrinsic fact that it IS handmade — I am obsessed with handmade plush and cute art that almost always involves animals or everday objects with a face…I know there’s a word for that but its not coming to me (I need more coffee). 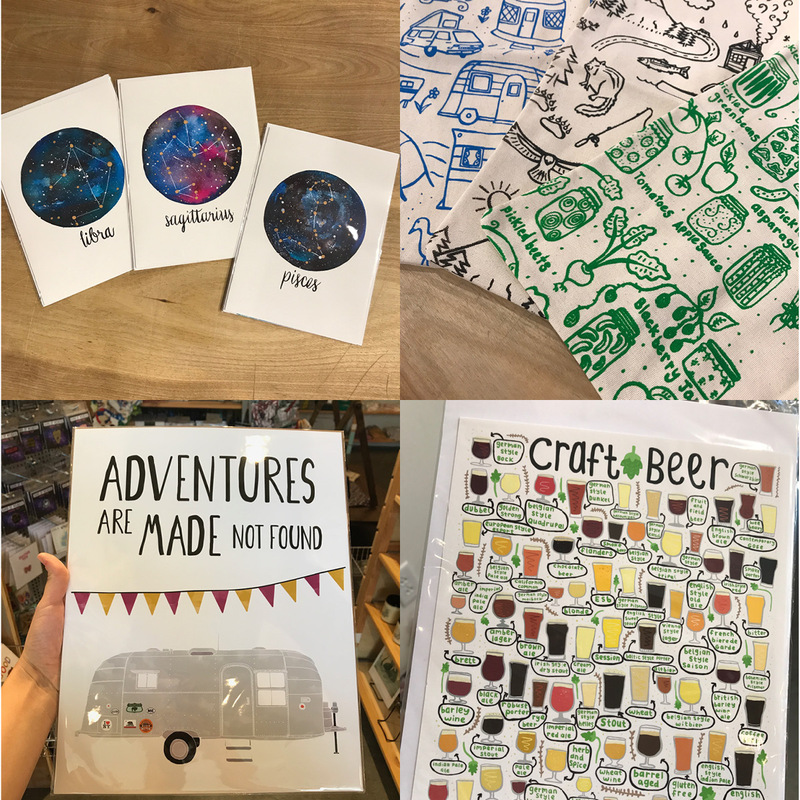 Hmmm…I don’t know that I could narrow it down to one, but I love all of the items that I have gotten from craft shows over the years, whether its jewelry, clothing, art or even food. People probably would not believe that I can deadlift more than 200 pounds. Well in the same vein, I am an avid crossfitter and LOVE to lift. I also love to cook, especially Mexican food. I love to dye and cut my own hair, its a bit of an obsession. 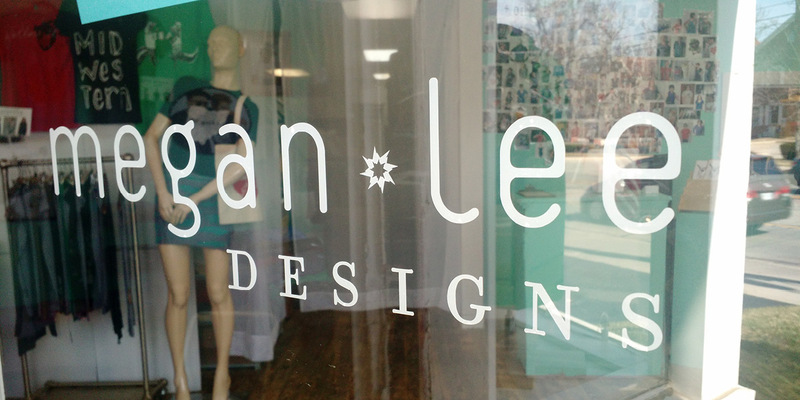 13| Where do you see Megan Lee Designs in the next 5 years? Wellllll…we moved to Ohio recently to be closer to family, and actually just signed a lease on a new studio space that has a retail component. 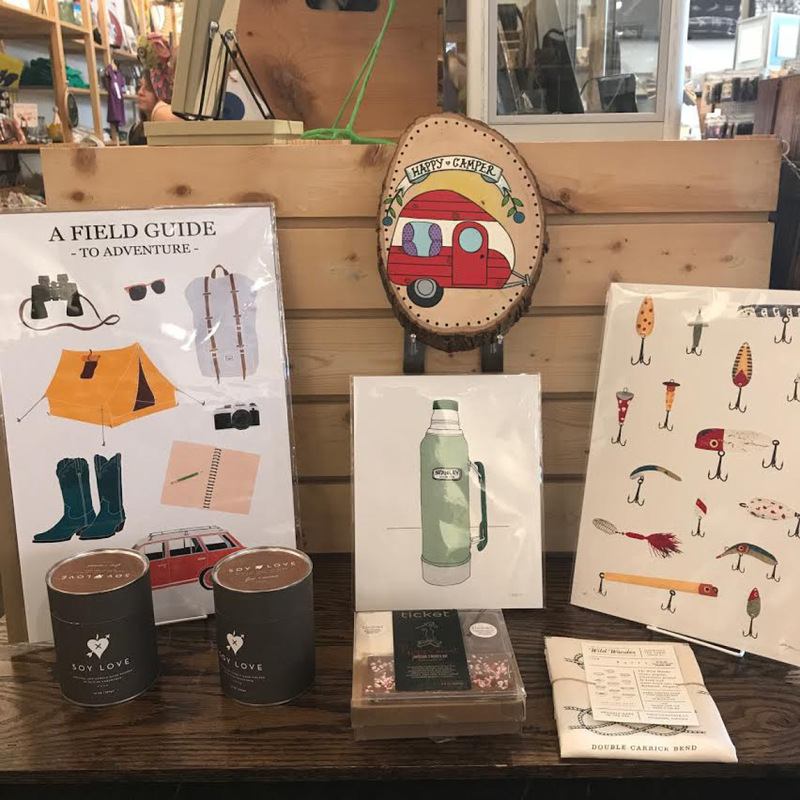 Its located in Westerville, Ohio, where we bought our house, so we are super excited about finally having a location where people can shop in person. 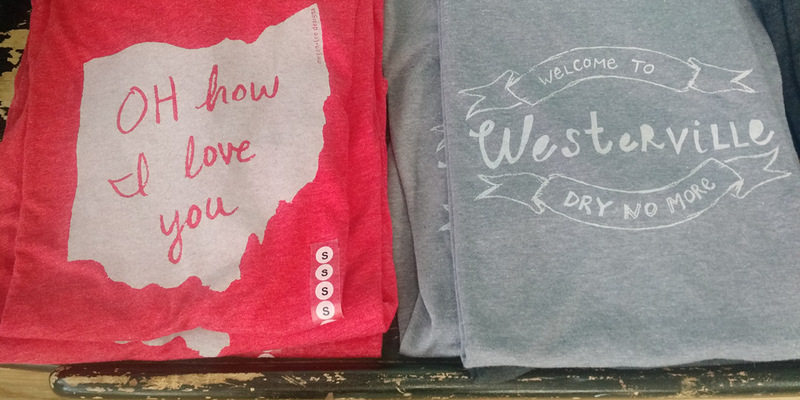 If you ever come to Columbus be sure to look us up, there are some surprisingly hip bars/restaurants/shops in Uptown Westerville — I’m proud to now call it home! Need more Megan Lee? 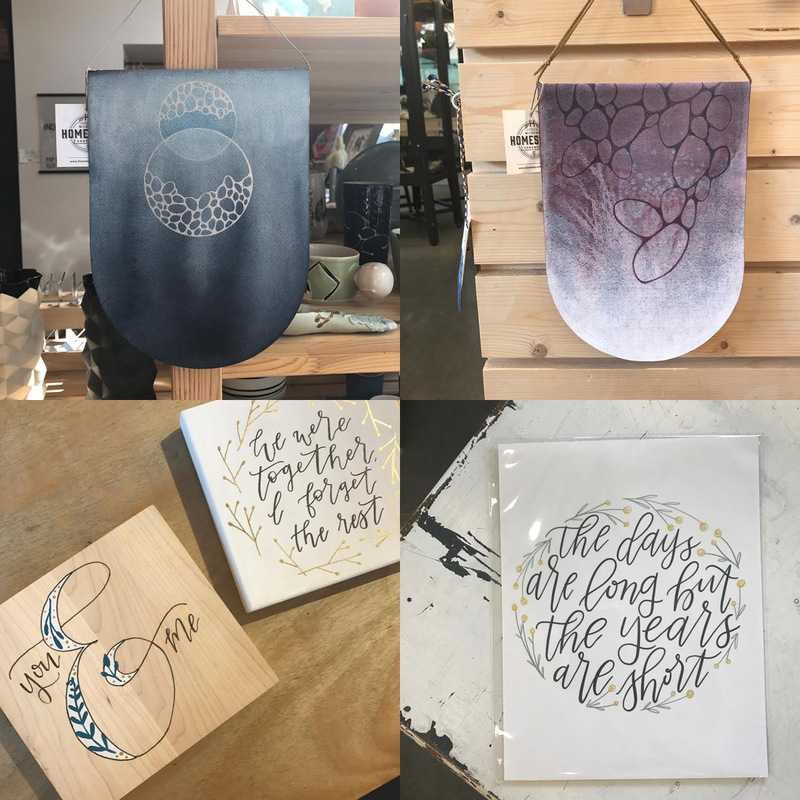 Come check out her goods right here in the shop, or check her out online, on Etsy, Facebook, Twitter, or Instagram! Thanks, Megan! 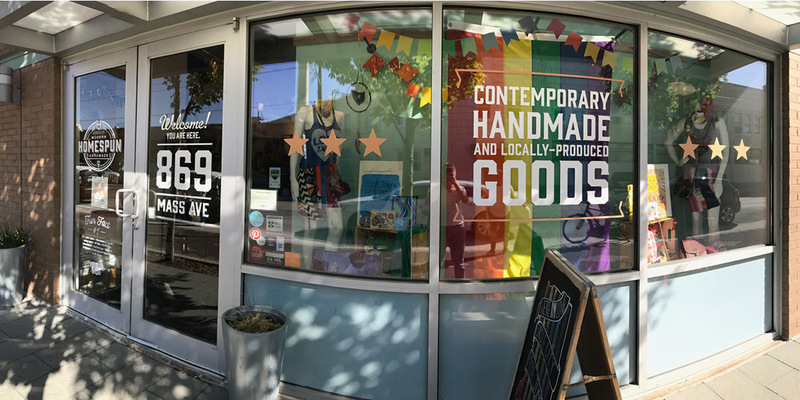 Our sunny, colorful shop is waiting for you to discover all kinds of great handmade goods this week! 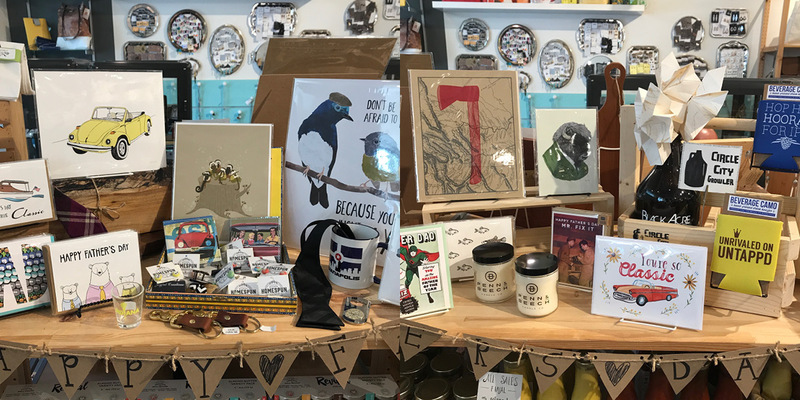 We’ve got a lot of new things going out on the floor- we’re freshly restocked from the Handicraft Exchange this past weekend. Shout-out to everyone who made that such a great day! Squeeeeeeeeee!!! Need I say more? Mini planters (in monocles, no less) from Scavenge & Bloom. 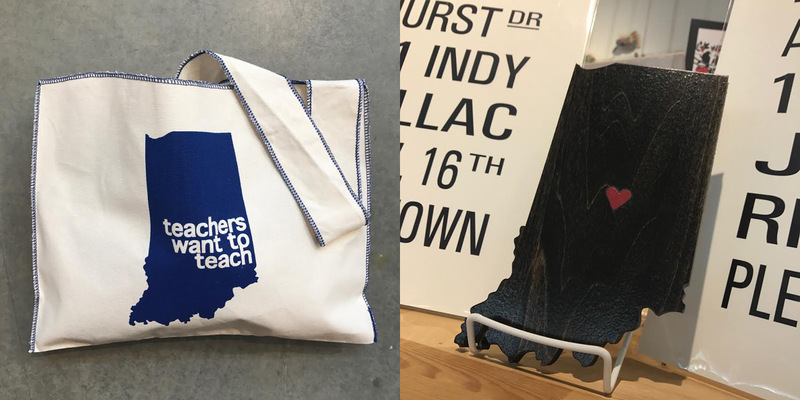 Bag by Bad Knees Tees and Indiana wall art by Inspired Woodcrafts. 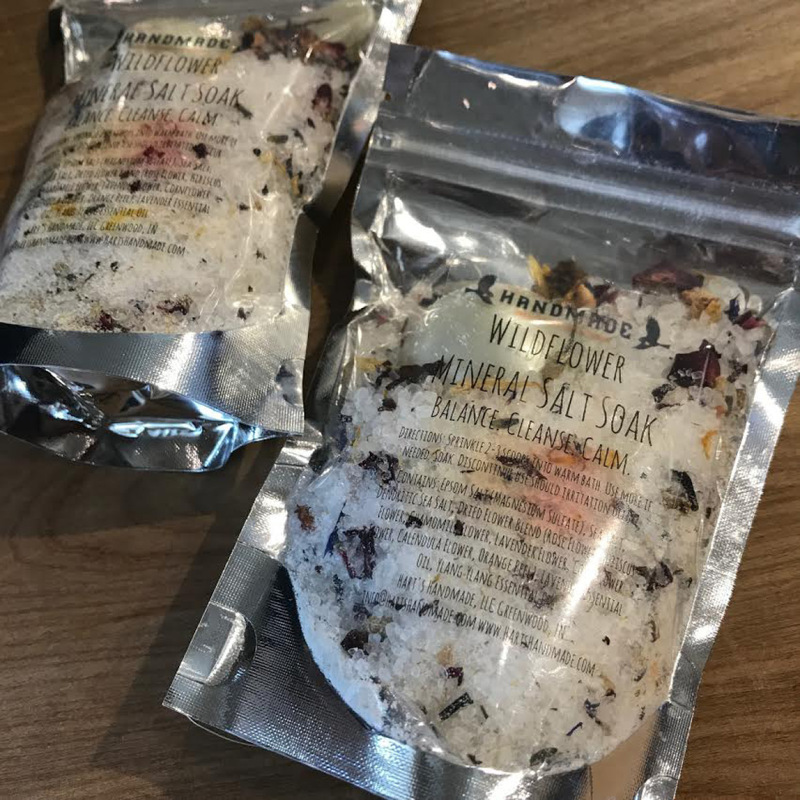 New goodies from Hart’s Handmade! 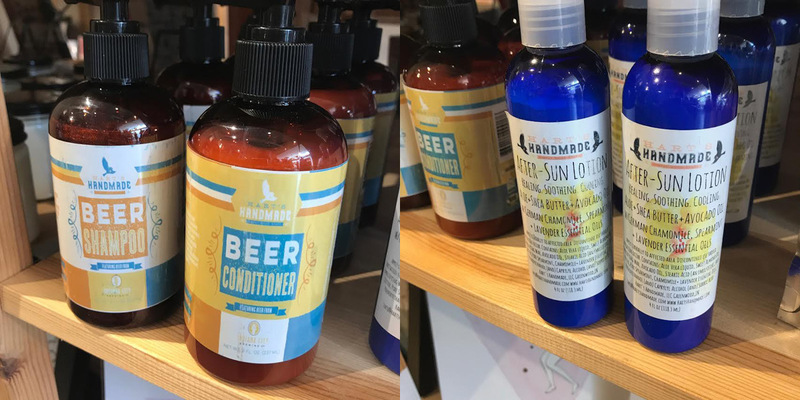 That shampoo and conditioner smell amazing. We’re ready for some summer adventures, how about you? Or then again, maybe we’ll just stay in and read all day… We have the most beautiful, unique books for your kiddos. 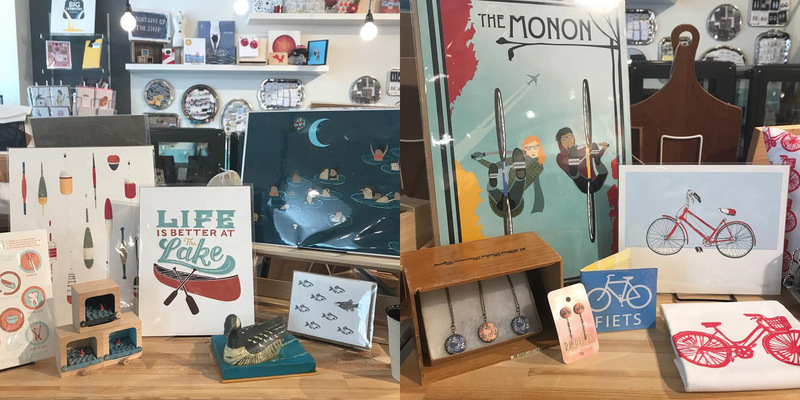 Father’s Day is coming up and I don’t think we’ve ever had such a unique and wide selection of gifts for dad. 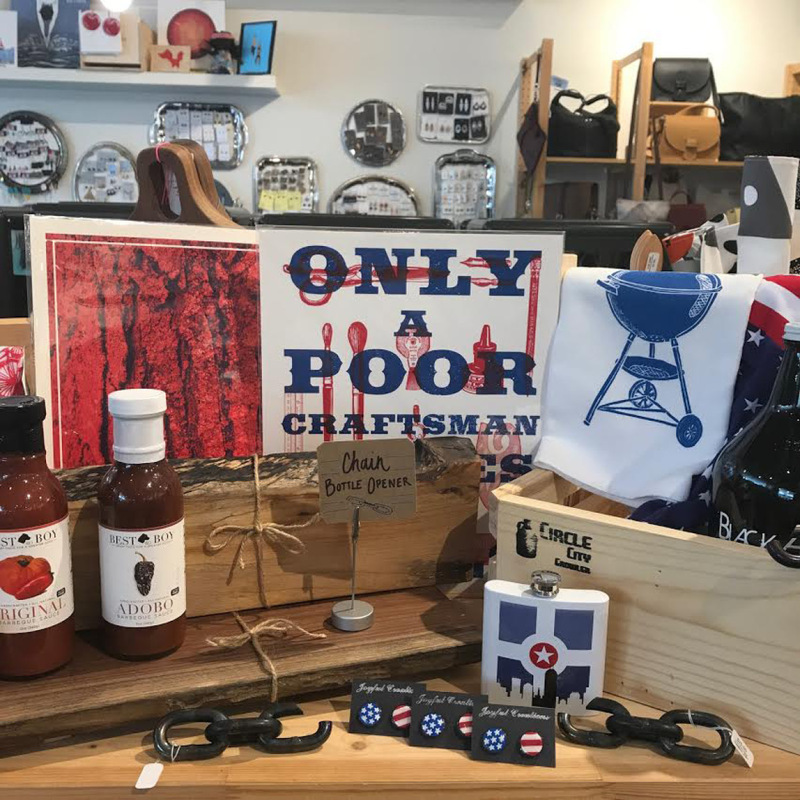 Whether dad loves food, beer, alcohol, books, dressing classy, or gardening, we’ve got just the thing! Not to mention the cards. To all you dads out there who’ve worked hard to care for us, you deserve to be treated. My choices this year. Iron Leaf Press on the left and Arsenal Handicraft on the right. This flour sack tea towel is so classey with illustrations of different knots. 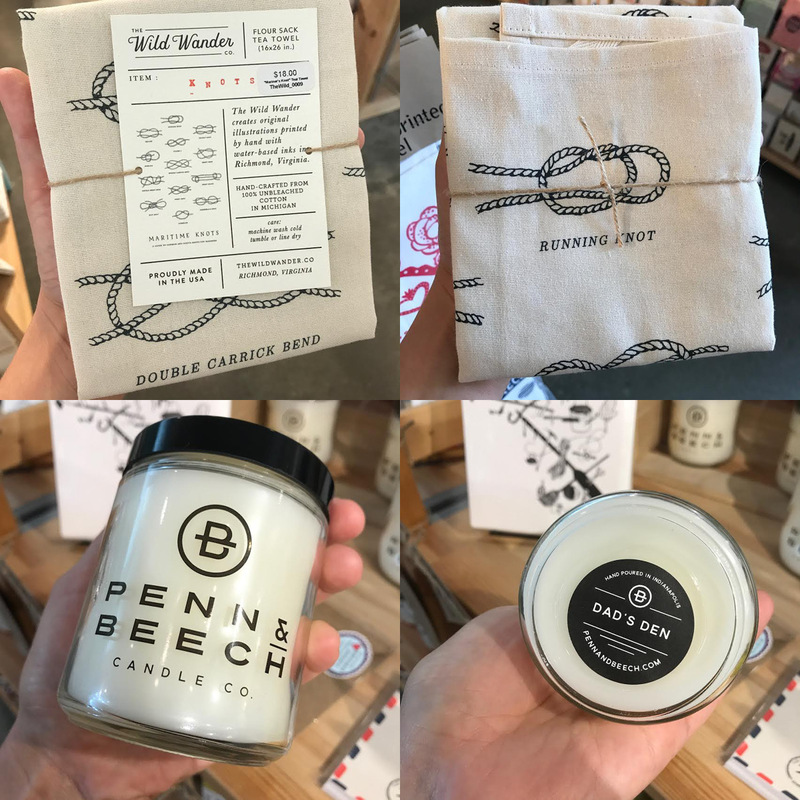 And a Dad’s Den scented candle? Um, yeah. And, of course, beer. 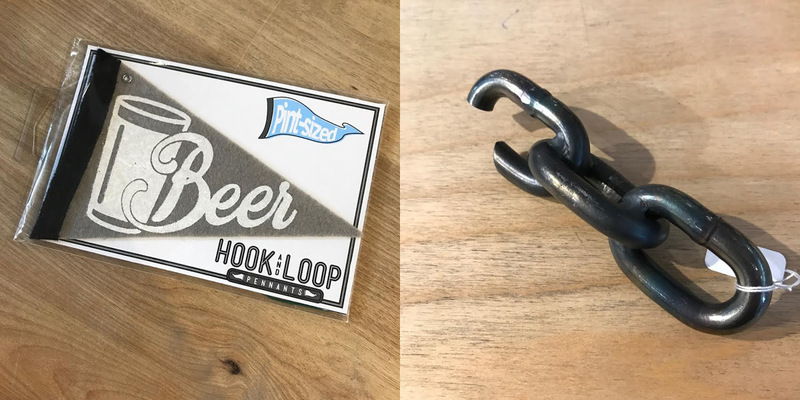 This little Hook & Loop pennant is the perfect way to give beer a little cheer, and this bottle opener by The Machine Shoppe is tough and useful, just like dad. Still can’t get over the detail and beauty of these wings from Green Beetle Shop. This adorable wire wall hanging by Gauge NYC would be the perfect little touch to any room. Do you know someone who could use a gentle soothing smile in the mail? This card by Haven Paperie is just the thing. I have LOTS to show you since my last This Week update. We’re all decked out with pride for PRIDE! 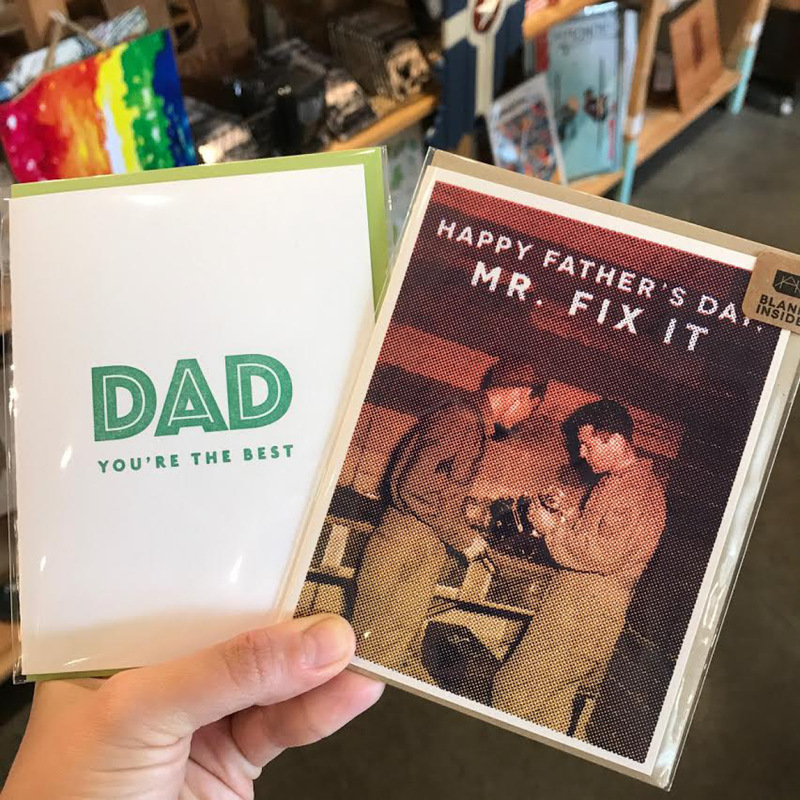 Plus, the Handicraft is coming up on the 17th (deets below) and don’t forget Father’s Day on the 18th (gift inspo below). 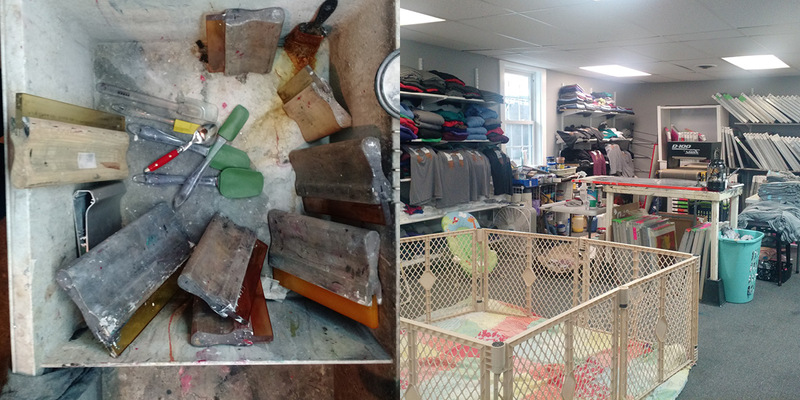 Such a fun month here at Homespun! Best doormat ever by Laura Jane Handmade Co. 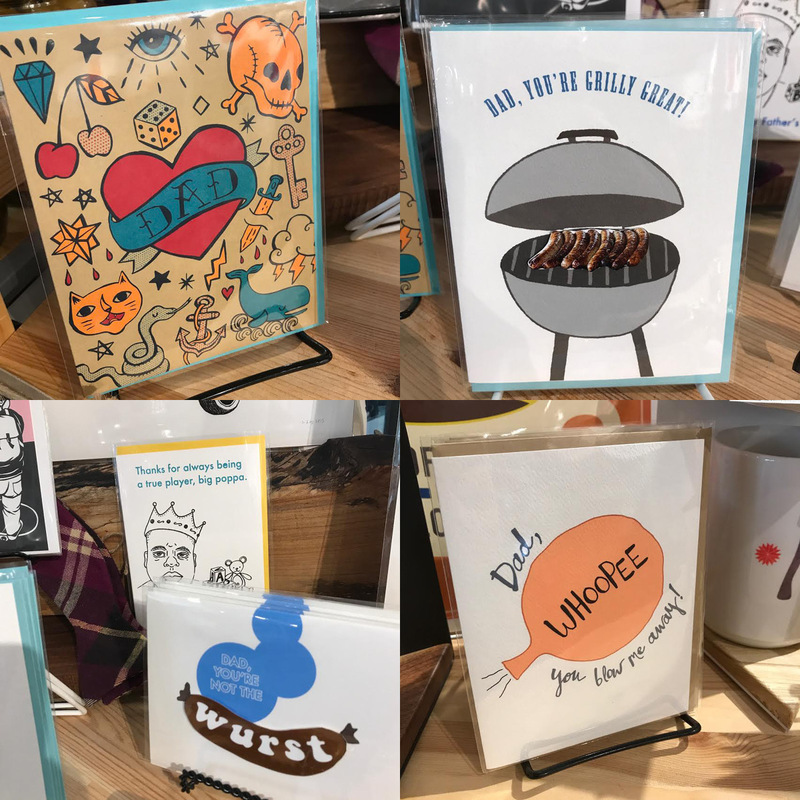 Huge selection of hilarious cards from Paper Wolf Design, bicentennial stickers from United State of Indiana, and lovely little mid-west cards by artist Rebecca Stockert. 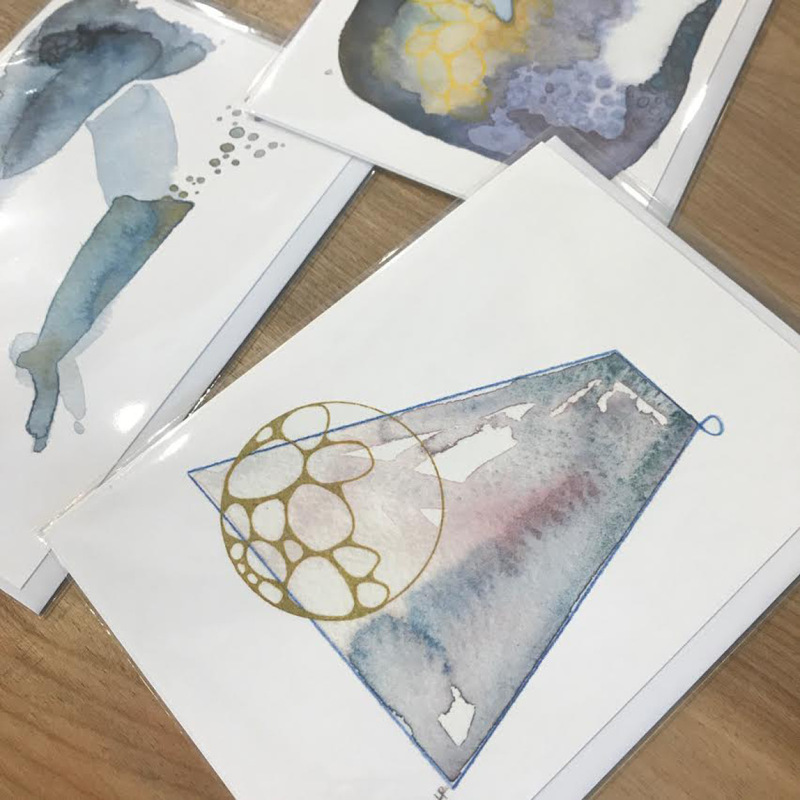 Gorgeous zodiac cards by A Quartzy Life, cutest kitchen towels and prints by One Lane Road. 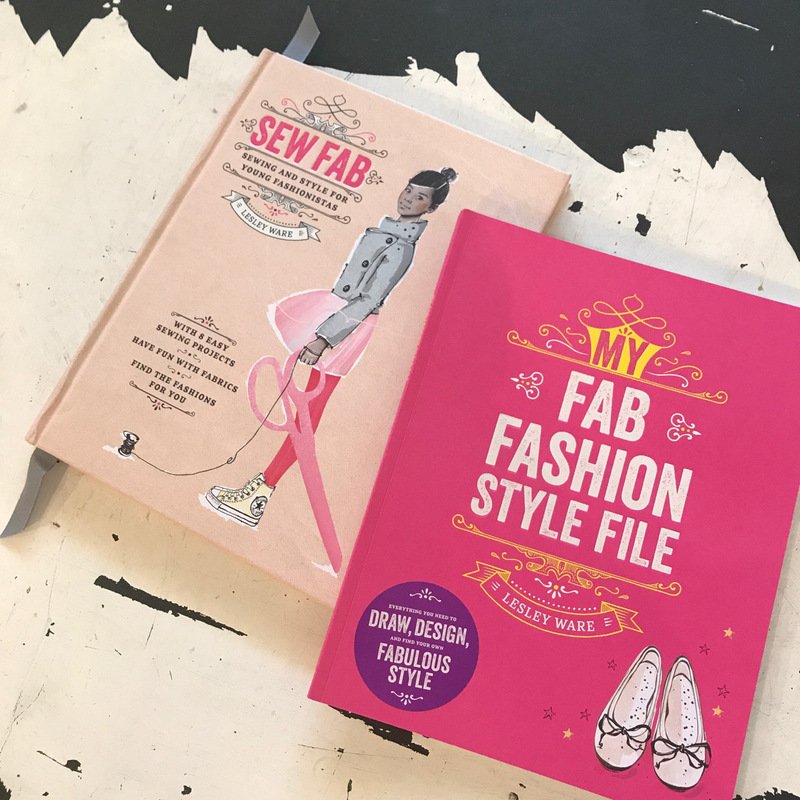 The coolest books for the budding fashion designer by Lesley Ware. New stationery by yours truly a.k.a. 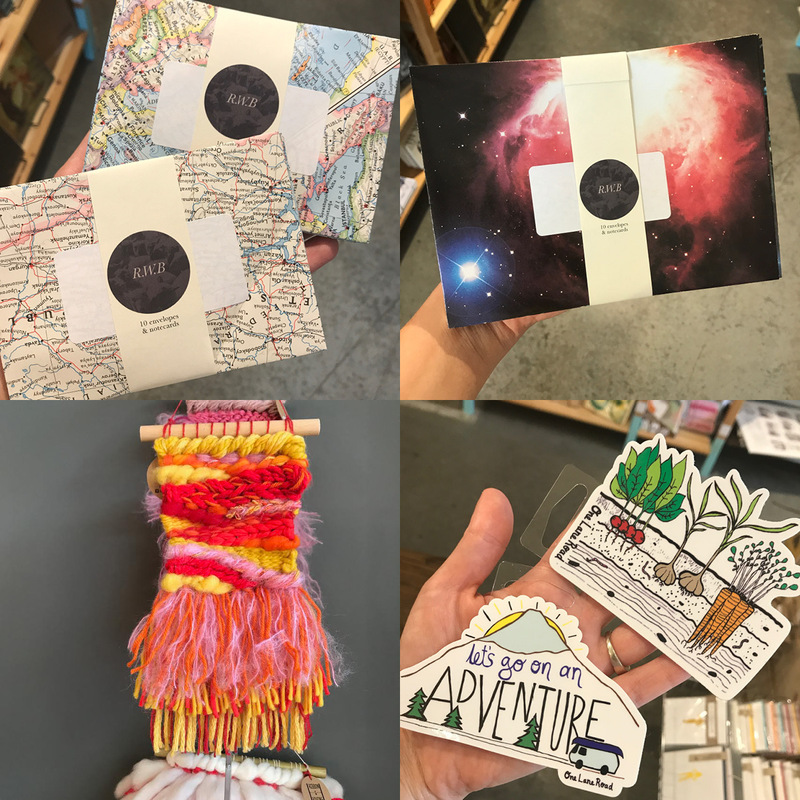 Read Write Books, stickers by One Lane Road, and weaving by Ribbons and Roving. The most beautifully colorful (and those French knots!) 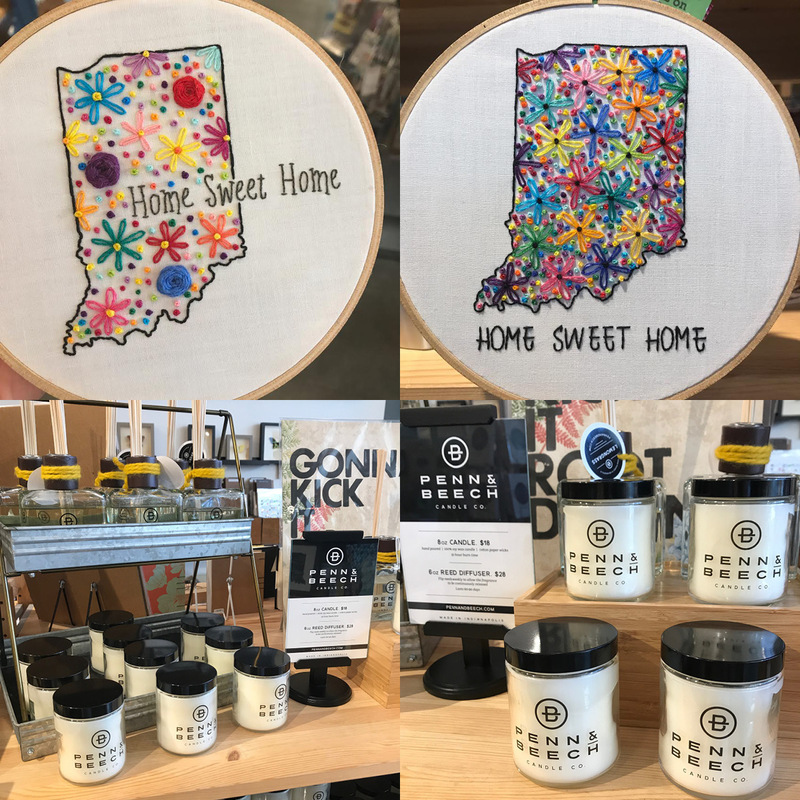 embroideries by Needles and Knots, and a brand new line of candles and diffusers, Penn & Beech. All this adorableness comes to us from Wee Moochi. 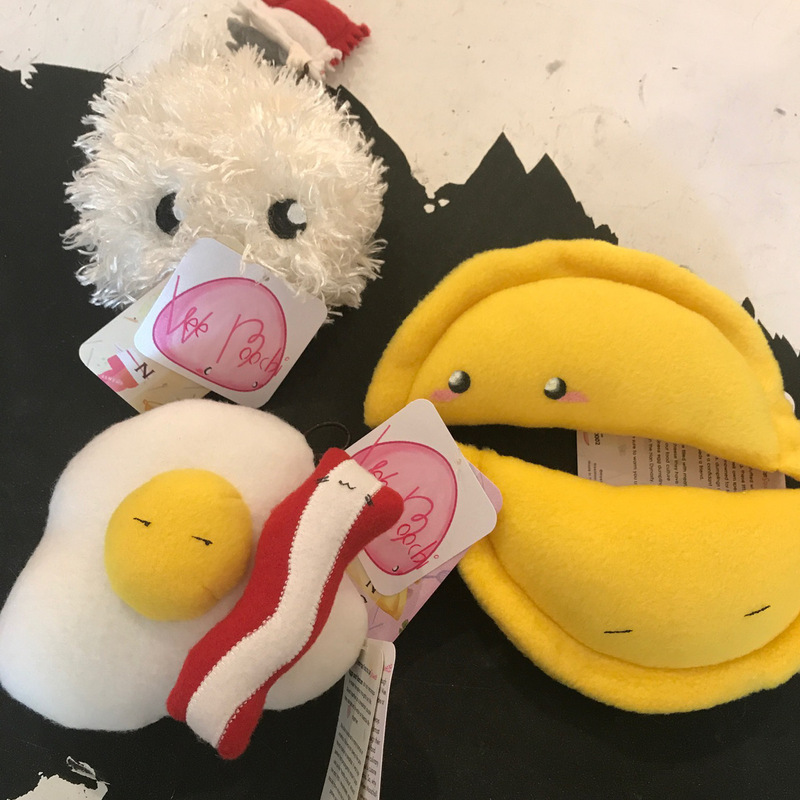 Up there we have little stuffies of ramen, egg dumplings, and eggs and bacon. Sushi and bubble tea pins below! Let’s just say, we’ve got you covered. 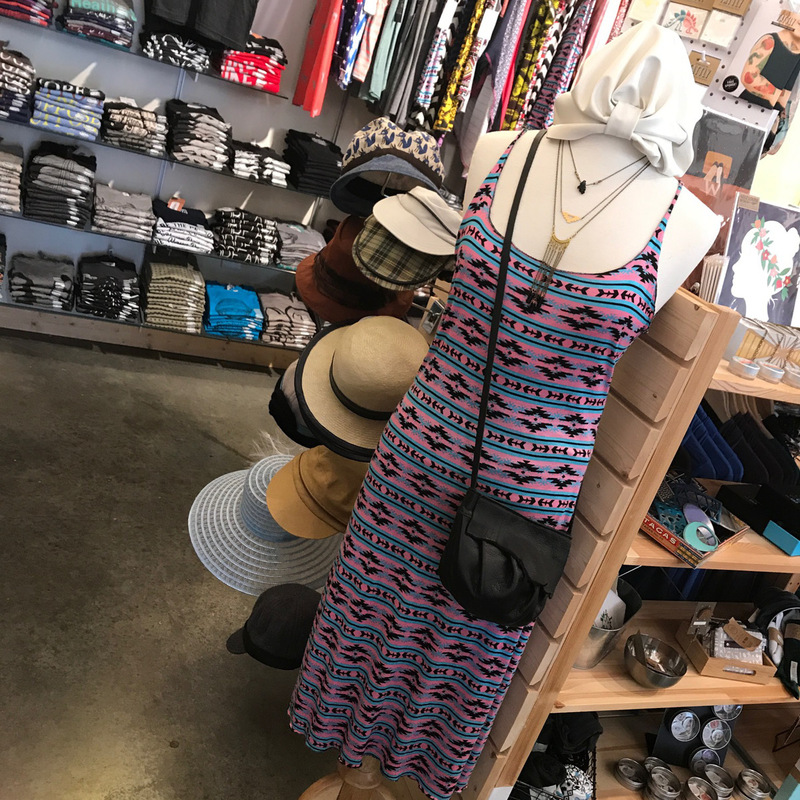 We’re ready for the next festival or flea market in this dress by Nicole’s Threads, bag by ReFind Originals, necklaces by Nice Lena, Grey Theory Mill, and Astronette, and turban by Just Liv.